LinkLocker is a fast and convenient bookmarking service that respects both your privacy and the security of your data. LinkLocker is a fast and convenient bookmarking service that respects both your privacy and the security of your data. There are easy ways to save links into your account from anywhere you might be on the Web, right from within the browser on any device. 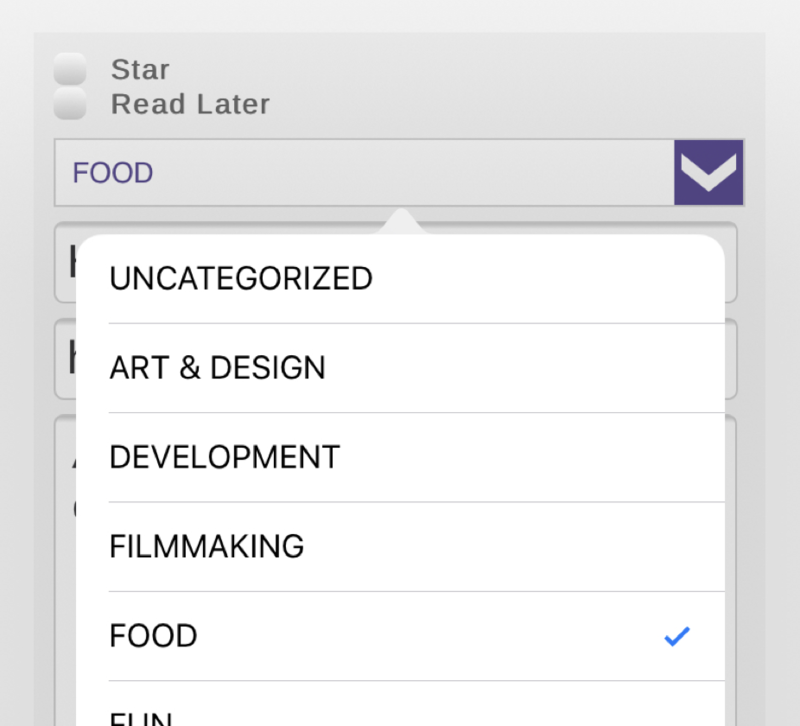 Organize your links with categories, tags, and stars. Find everything later with integrated search. Access your data easily, while keeping it completely private. Add links to your LinkLocker account easily using our browser extensions for Safari, Chrome, and Firefox. Tagging is great for grouping your links by topic, to classify things which pertain to a specific project you're working on, etc. Categories are hierarchical: they can have an arbitrary number of subcategories—each of which can have its own subcategories—giving you the flexibility to organize your data in a tree-like structure with as much or as little complexity as you like. LinkLocker is designed to respect your privacy. We don’t track you in any way—and because we won’t run ads or have shady business partnerships, we don’t have any incentive ever to begin doing so. 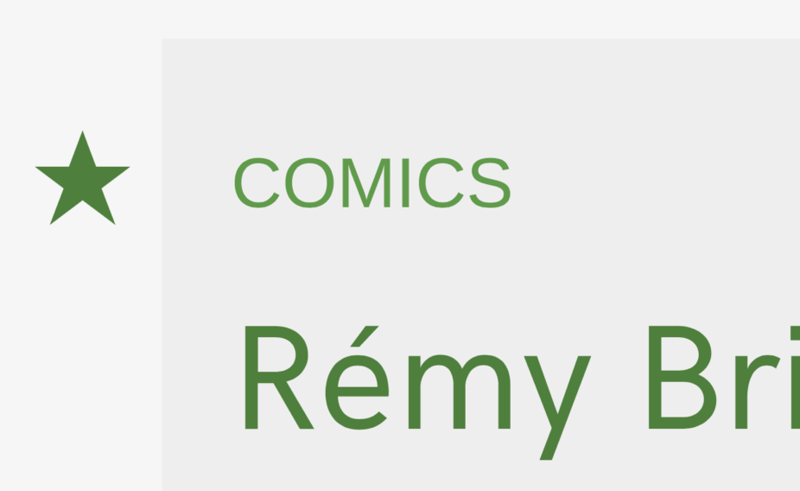 Starring links is a quick way to visually mark a particular link as an important one. 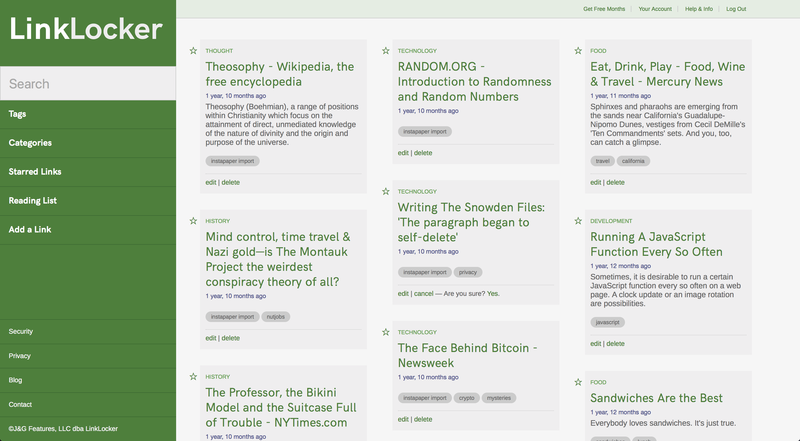 You can then easily retrieve a list of just your important links on the Starred Links page. 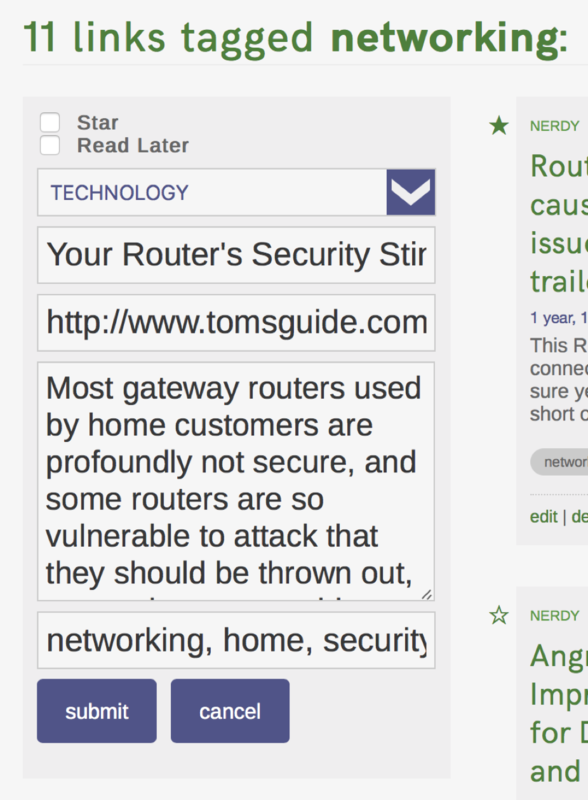 When you add or edit a link, you can mark it to be "Read Later." 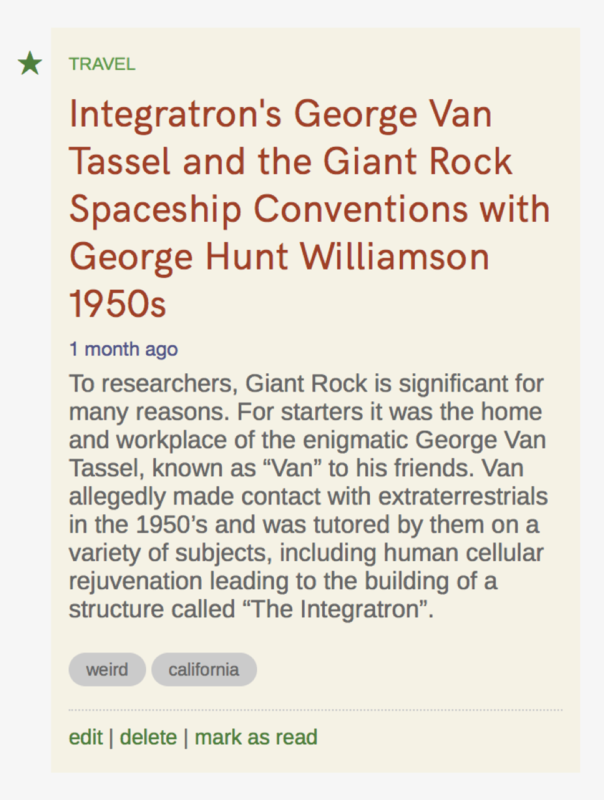 These links will look a bit different in your list of links, and can also be found grouped together on the Reading List page. Once you have read the content the link to which the link points, just mark that link as having been read. Edit a link on the fly anywhere you see it. 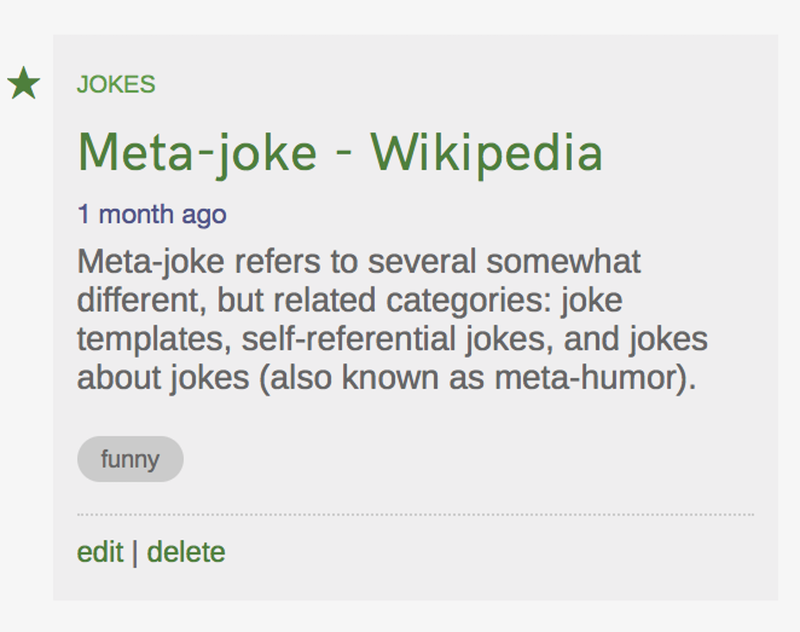 You can change the category, add a new tag, or make any other changes you like. When you're done, the content is edited right in place. 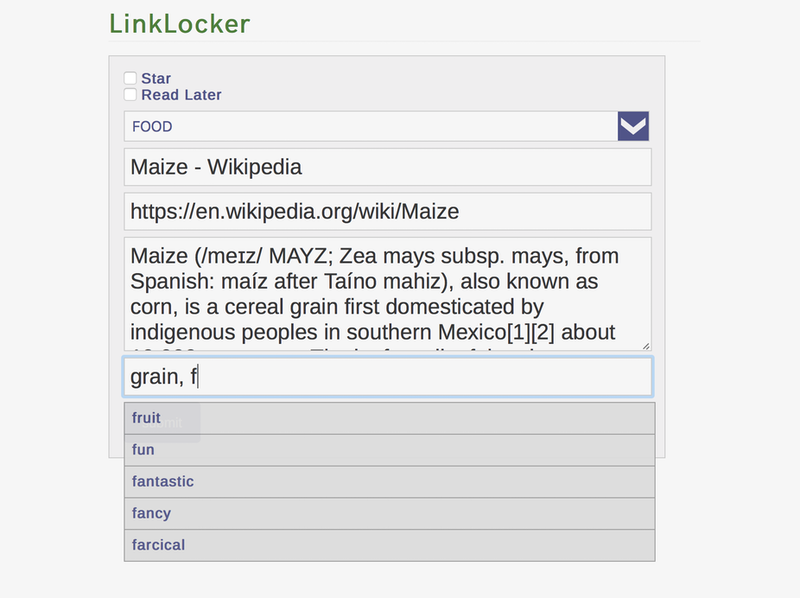 LinkLocker will search the full text of your data. 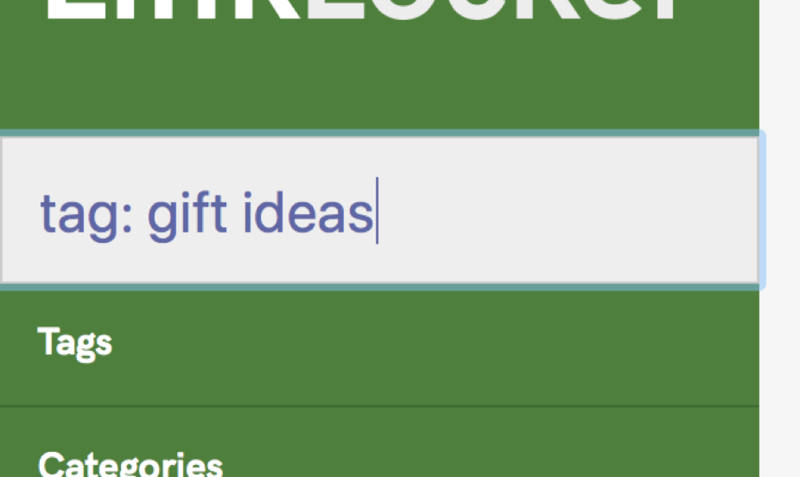 On most pages the search field automatically has keyboard focus, so you can just start typing a search query nearly anytime. LinkLocker is just as easy to use on your phone as it is on your laptop. Browse, search, and add content—all right inside your favorite mobile browser. We make it easy for new users to bring their bookmarks from other services into their LinkLocker accounts. 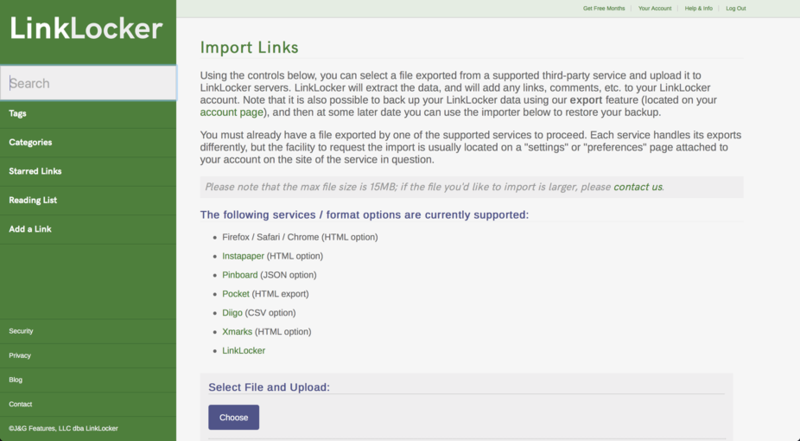 Import works with data from Pinboard, Instapaper, Pocket, Diigo, Firefox, Chrome, Safari, and Xmarks. Export your data—all of your data—at any time in the widely supported JSON data format. Our full-featured REST API lets you work with your LinkLocker data programmatically, if that's your thing. See the API documentation for details. Ready to give Linklocker a try? Sign up now for a free three-day trial. Cancel at any time, and you will never be charged. And don't worry—if you decide LinkLocker isn't for you, we'll still respect your privacy by not holding onto any of your data. There's nothing to lose.